Oh boy. As ever, this year's CES 2019 Las Vegas expo has had a host of treats for those of us after the latest and greatest in consumer gadgets. 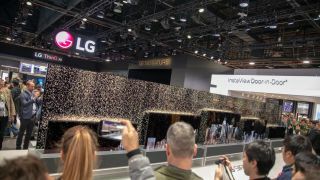 But nothing towered so tall over the expo as the TVs – sometimes literally, given the incredible size of the some of the displays manufacturers like LG, Samsung, and Sony were showing off to the crowds. We've made extensive roundups of the televisions announced by each manufacturer (found below), but if you're looking for the absolute standout TVs showcased at CES 2019, this is the list you need to see. Where's the TV? Is it on that wall? No, the TV is the wall. Samsung has been truly playing with the forms of the TVs of tomorrow, with a modular panel technology that allows it to create a dizzying variety of shapes, sizes, and aspect ratios. Seeing small pieces of panels detach and combine on the show floor was a treat for the eyes – and a glimpse into the malleable forms starting to make their way into the market. While a 143-inch model of The Wall first came to market last year, Samsung's advances in the technology has expanded the range to a 75-inch model called 'The Window' that you can actually fit in your home (maybe), and a 219-inch model you certainly can't. Expect imitators, and hope we see some affordable versions of the technology down the line, however long it takes. Until then, you can check out our first impressions in our LG Signature Series OLED R review. It wouldn't be a CES roundup without mention of 8K. The burgeoning resolution is coming to more and more flagship televisions, even if few people will be able to make use of it with actual 8K content. Sony's Master Series Z9G doesn't care though – seeing as it has an advanced machine learning algorithm for upscaling to 8K, and the hefty X1 Ultimate processor to power it. The Backlight Master Drive from Sony's 2016 Z Series TVs bulks the shape out somewhat – while also acknowledging that, sometimes, you just need bigger hardware to get the job truly done. There's been a big push towards not just high quality resolution panels, but those that can faithfully recreate TV shows and films as their creators intended – just look at Sony, which has thrown in a Netflix Calibrated Mode on all its Master Series TVs. Panasonic, however, has calibrated its GZ2000 OLED TV with the help of a Hollywood movie colorist, for what it calls "unparalleled color accuracy", as well as including its new HLG Photo Mode for viewing hi-res Lumix photographs. Is this really "the world's most cinematic TV"? We'll let you know when we've had the chance to test it thoroughly – but the focus on faithful recreations of shows, films, and photos can only be a good thing. Hisense is increasingly making a case for itself beyond budget TVs. The Hisense 75U9F is a 75-inch Quantum Dot screen with Android TV, 1,000 local dimming zones and a peak brightness of 2,200 nits. That puts the U9F on par with Samsung's Q9FN QLED, which debuted in 2018 and became one of the best TVs of last year. There was chatter at CES over Hisense's new ULED XD display tech, which uses a dual-layer panel (essentially a 4K screen with another HD screen behind it) to enhance local dimming and dynamic range – though we're yet to see any models announced with the new tech. Sometimes less is more. Hisense's Sonic One television is an astonishing 1.1mm thin at its thickets point, without having to outsource its processing or speakers to an external system. That's thanks to a Piezoelectric speaker design that 'pumps sound from the panel' itself instead of through a traditional cone driver.